For those of us who aren't blessed with a fancy espresso maker, we can utilize the Italian “Moka Express” to make a decent cup of strong coffee or relatively weak espresso without spending a lot of money. These pots are quite inexpensive and can be found in most kitchen stores. The coffee is actually quite good and the mechanism is simple: The aluminum pot utilizes pressure to force steam to build up inside the lower section, forcing the surrounding boiling water up the funnel through the coffee powder and into the upper chamber. We have a smaller model that holds one cup of water resulting in one larger serving, or two smaller ones. 2. 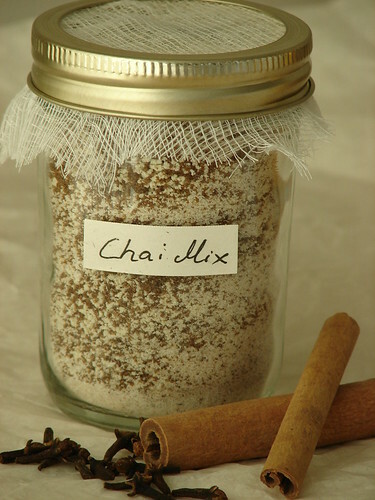 Fill the coffee basket with about 2 tablespoons of finely ground coffee, or to the top and press down lightly. 3. Assemble the pot and put on medium-high heat and leave for a few minutes. Soon you will hear a “gurgling” noise as the steam bubbles mix with the upstreaming water. 4. Remove from the heat and let all the coffee collect. Either drink straight, or make a nice cappuccino or latte. Have you found a good brand of espresso roast coffee to use? I have tried a number of (pre-gournd, whole bean) from Whole Foods 365 house blend, to a number of European brands and just not satisfied. We usually go for a dark Italian roast or a dark French roast, ground finely, but not espresso-finely. As for a particular brand, we usually just pick up a local brand from the supermarket and grind the beans in the store. If you have tried so many different kinds, maybe it's your brewing method that's at fault or your storing method? "it's your brewing method that's at fault or your storing method?" Possibly both as the espresso tends to sit. Name: Steve | Comment: I have a question. I used to live with an Italian imigrant who had one of these pots and had his mother bring us Lavazza coffee from italy when she came to visit. We consistently made incredible, rich-tasting coffee with even a bit of that foam (crema?) by using filtered water all the way up to the release valve, and filling the basket and leveling off, just like its described in your article. We kept the grounds in a cookie jar on the counter and used a gas stove. Now that I no longer live with my friend, I've tried to reproduce our success in my own apartment, and I consistently get NASTY coffee. It always tastes like beans and water, as opposed to coffee, if you can understand my meaning. Its very bitter an acidic and leaves an awful after-taste. I've tried keeping the grounds in the freezer, on the counter, or in a cabinet in a ziploc bag. I've tried overfilling the basket, and underfilling. I've also tried reducing and increasing the heat on my electric stove to get the brew time to fluctuate between 3 and 7 minutes. I use the same Lavazza coffee we used to use, except this obviously wasnt imported by his mother. It seems I'm more careful with my preparation and storage than we used to be. In fact, we used to keep the grounds right next to the stove where they say to never store any food ingredient! We also used to scrub it with soap and water, which is another thing i've read could impart bad flavor. Anyway, any tips on what I might try? I'm so confused! Steve - if you're using the same pot, then maybe it's time for a rubber seal replacement. After a while the rubber seal needs to be changed, so perhaps the seal is the reason for the bad taste you're experiencing. Name: Rob | Comment: Is it just me, or do you think the smell of the used coffee is nasty? I don't really like the taste of the coffee that my coffee maker produces anymore as i can taste the used coffee smell in it. As Steve said, it tastes more like drinking ground bean and water. When i tried using Illy coffee instead of Twinings, it was even worse. I think it tasted better when i first started using it though, but i can't see how it could have got worse... Maybe the rubber seal needs replacing, but how would that affect flavour? Name: Phil | Comment: I've been using these coffee makers for years with great success. For best results grind your own beans as you need them. Electric grinders cost less than the pot. If you like milk, heat it in a saucepan. However, just lately my pot has refused to function properly. It takes ages and seems to lose most of the water in evaporation. The resulting coffe is bitter and awful. I've replaced the seal - no change, run just water throught it with no coffee several times - no change. sworn and cussed a lot at it - no change. Do I just have to buy a new pot every few years? Surely not. I can pour water through in reverse without any seeming blockage. Arrgghh! Name: Rebecca | Comment: I put my stovetop esspresso pot in the dishwasher and it came out all tarnisehd looking. is it still safe to drink out of? it should be. the one we use is made out of aluminum and reacts easily with certain detergents and should always be hand washed. even if it is discolored if should be safe. you can always try a metal cleaner, or run it through a cycle with just water to try it out. if the water is discolored then you should clean it before drinking from it. Name: Karen | Comment: I was recently given a lovely moka by a friend in Italy. When I was there, I made wonderful coffee using a gas stove, but now I'm back at home and have a flat ceramic electric stovetop. Is there a good way to use a moka on an electric stove? Name: Ann | Comment: Yes, Karen, just make sure the handle is away from the heat. I have no problem on my electric stovetop. Used to have a Briel espresso machine. Ohha! Days of glory. After four years good service it died. Can't afford to replace it so I bought a hob top espresso pot. Oh dear. Every cup tastes of nasty rubber. I have tried "running it in", but the taste persists. I didn't. I gave it up for a cafetiere. Third rate coffee, but at least it is drinkable. So what is wrong with my espresso pot? It was brand new, in perfect nick, and I followed the instructions assiduously. Name: Babak | Comment: - Never wash your Moka machine with soap. The dirtier your machine, the better the coffee. - Always use max water and coffee (without pressing the coffee). - If you can grind your own coffee, great. If not use an Italian brand (Illy, Lavazza, ...). - Never put the stove on max heat. - If you haven't used your machine for a few days, throw out the first coffee you make. - Leave the lid open when coffee is made, so the vapors go out and you get a richer coffee. - Stir the coffee in the pot before serving (more dense coffee stays at bottom). Name: Lila | Comment: Hello. I've moved from a place with a gas stove to an electric stove. I think that in the long run the cafetiere will kill the electric stove because it's bottom doesn't cover the whole surface. Is there a technique to keeping the electric stove safe ? Name: Karen | Comment: I have a mokka no-mame from ikea and the best coffee i've been able to make is with the illy expresso blend. Just got a bean grinder and got the regular illy (not expresso) and ground the illy beans fine but the coffee is totally weak!! Any ideas what I might be doing wrong? Name: Michael | Comment: I wish I'd known about these sooner. The coffee is VASTLY superior to anything I've ever got out of a french press. And because most cafes around here tend to burn their beans/coffee, it tastes better than the "real" espresso based lattes/cappuccinos I've been buying lately. I got a 3 cup version, but I make coffee just for myself. I use less water (about 100ml) and a standard 7g scoop of coffee. As long as you make sure it's spread out (but not pressed) in the filter part, it works well. 100 ml in gives me about 50 ml (the rest is lost as steam or left in the bottom part) of very decent coffee (equivalent in strength to 30 ml of real espresso). I used medium heat on my smallest burner, and what I've found that at first the dark coffee comes out and then I leave it a little longer, and foamy coffee starts coming out, which is the crema. At this point I turn down the heat to minimum and let it extract a bit of this foam. If I leave the heat up, I end up with grounds coming up with the bubble, if I take it off the heat the crema stops immediately. This plus a cheap electric whisk makes me very very decent lattes and cappuccinos! Name: Jason Pratt | Comment: I have the same problems Steve did. Bitter, nasty coffee every time, even when I'm using Lavazza beans. I just bought my pot new recently so I'm still trying to figure it out, but are there any common mistakes people make that make moka coffee taste bad? Name: C.Rod | Comment: If you are burning the coffee somehow maybe you're putting the coffee in the wrong place,, because it is almost impossible to happen. Try the wikipedia information it clearly shows how to use it. Name: Paul | Comment: I have one of these machines, new, but almost all of the water stays in the lower chamber and only a dribble of coffee gets to the top. What am I doing wrong? It is the same if I take it off the heat or leave it on. Name: Jason | Comment: I found the best espresso and don't snicker and raise your brow...it's the little yellow air tight packages you find in NY Bodegas and at c town in the "cheap" area of the coffee section. It is called Cafe Bustelo. For some reason, The little Moka maker and this 'little espresso that could' are made for each other. It makes espresso FAR superior to the expensive italian and French brands that my Italian and French Roommates bring in. When you smell the grounds upon opening compared with Illy, the difference is noticeable. Cafe Bustelo has this old fashioned, old world aroma. 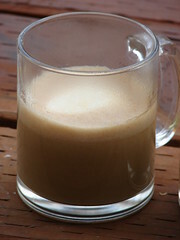 When made with milk foamed up with an "Aero Latte" wisk with brown sugar or honey, it is far and away a better latte, cafe au lait, capuccino or whatever espresso beverage than any of the 6 Starbucks on your block can offer. 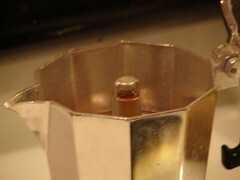 Also, Don't wash out the Moka, only rinse and rub away grit and stuff with your fingers, but DO keep the screen clean! Name: Arup | Comment: I'm having some problem with my Moka pot - at first small amount of coffee brews and collects on the top chamber - after that only steam comes through the central column- no stream of coffee. There is no leaking of steam through the central joint and I never hear the gurgling sound. Name: Tiz | Comment: It happens because the pot heats too much. What you have to do it take it off the heat and water the bottom of the low chamber. You can do it by putting the moka under a water flow or on a soak wet towel. After that, put the moka back on the heater. Have a great coffee! Name: andy | Comment: @ arup & paul: i found my brewer not working as you describe on the large burner, but it does fine on a small one. hope this helps. When brand new, or when not used for a while, or when using new rubber seals, fill the moka with water and a bit of vinegar, put don't put in any coffee. Heat on the stove as though you were making coffee, and let the water/vinegar mix boil up. Do this 2 or 3 times, then at least once with plain water. 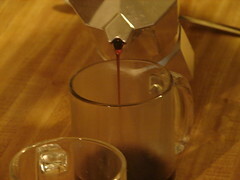 The vinegar helps get rid of the bad flavors due to residue on the inside of the moka. Name: Cathy | Comment: I did a really dumb thing and accidentally filled the bottom chamber with coffee and water (instead of just water, with coffee in the middle chamber). I usually use a french press, so that's probably why. I was able to make some coffee, but now need to figure out whether I can save the moka pot (the pressure pushed coffee into the chamber where normally just water moves up through the coffee layer). Arghh! Should have read this site before. Name: Bobby | Comment: I am so excited, I have used a La Pavoni latte machine for 20+ years with great results daily but when we would go to our cabin on the week ends it was way to big to take along and we would have caffine with drawls while gone with out it. I found my pot in a second hand store for $3.00 and really wasnt sure how it worked but could tell that it had great potential by the way it was designed. I found this site here and followed your instructions and 'Oh My Goodness' I have the greatest little latte machine for my home away from home with great tasting lattes everytime. I do use my same beans roasted here locally and use my grinder set up for the La Pavoni with a fine grind but it seems to be prefect. Thanx for your help. Name: Lee Capozzi | Comment: When I brew espresso on the stove, not all the coffee comes up and I don't now why. Name: John | Comment: I found that taking your pot off the heat a little before it's completely done gives me the best results. You will leave a little water in the bottom chamber when doing this, so you get a little less coffee, but you will lose the bitter taste and get decent results even with pre-grind coffee, enjoy! Name: Tim Douglas | Comment: Don't use too fine a grind of coffee or the particles will block the holes in the funnel and the filter , hold them up too the light and observe if they're blocked -could unblock by poking with fuse wire or other fine wire . Don't return the maker to the hot stove after you've poured out the coffee, even with heat off, the metal supports can be very hot ! The metal of the maker wll conduct the heat, and with no liquid to dissipate it ,he rubber seal will rot and impair the flavour or no longer seal properly stopping much of the water from being forced through the coffeet( And of couse ,and weve all done it, avoid putting it on the stove with coffee loaded but having forgotten the water -fatal for rubber seals!) The sugestion to use vinegar to clean is probably not a good idea ,as acids attack aluminium ! Name: | Comment: Please help: all of a sudden now, the water just boils away and evaporates, instead of filling top with coffee. This after I;ve been using my beloved Mokka Pot for three years successfully, and I just replaced the gasket. 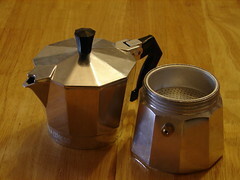 Name: Coffeeguy URL: cnn.com Comment: I've been using a stainless Bialetti moka pot for years. When I first got it, the coffee tasted burnt and a little 'rubbery'. Eventhough it smelled great in the can, when I switched from using Trader Joe's coffee (I can't remember which variety) to Lavazza, the burnt rubber flavor stopped. I've had better luck with their other varieties. These days I get the bulk espresso roast beans at Sunflower Market and hand grind with a turkish grinder I found on fleabay. The grinder at the store works well too as there is a setting specifically for moka pots. I also found that if the pot doesn't produce as much coffee as you were expecting, that tightening the 2 halves of the pot more firmly solved the problem- there is pressure created and if the pot isn't tight around the gasket, steam will escape and your coffee will suffer. I use soft water filtered through the fridge, so scale has never been a problem for me. I ONLY hand rinse and dry the pot and never use soap. I've read that you shouldn't leave the spent grounds in the pot all day. My guess is that the residual acid in the grounds eats the pot and imparts a nasty flavor, especially for aluminum pots. Also, DON'T OVERFILL THE POT WITH GROUND COFFEE as the pot can build up too much pressure and explode. I over packed it once and fortunately it just blew coffee all over my kitchen instead of blowing the pot apart. It was still a pain to clean up the coffee and grounds that were blown in to every crevice of my white kitchen. A good rule of thumb- fill the coffee holder flat or gently rounded (flatter for finer grinds). I hope my experiences help you get a better (and safer) cup of coffee. Name: Michael Comment: If your water just "boils away" be sure to make sure the safety valve is not leaking steam.. Steam will escape from the valve thus not allowing it to "perk" thru the center stem. Name: Gypsy Comment: Hi: should I be worried about the fact this coffee pot is made of aluminum? How To Store Butter – How Long Can You Keep Butter Out? Safely Storing Food in a Pantry - How Long Do Staples & Canned Food Stay Good?